Newlin Mill Park. Restored 18th-century milling community, with an active 1704 water-powered grist mill. Hiking, trout fishing weekends, picnicking and nature walks. Rt. 1 & Cheyney Rd. NewlinGristMill.org. Springton Manor Farm. The 19th-century manor house was the country estate of a prominent Philadelphia family and is now a demonstration farm where children meet animals in a petting area and learn about farming. Park open year-round. 860 Springton Rd. ChesCo.org/CCParks. Nor-View Farm Park. A real working farm with a plant nursery, mini farm and ice cream shop. Visit the farm and observe the animals from spring to fall, shop in the nursery and take advantage of the well water available for purchase. 670 N. Henderson Rd. Facebook.com/NorViewFarmGardenCenter. Colonial Pennsylvania Plantation. Recreation of a 112-acre working 18th-century farm, with farmers and guides in period garb, Belgian horses, Red Devon milking cows, Dominique chickens and two very large pigs. They hold many events throughout the season, Apr–Nov. Weekends, 3900 N. Sandy Flash Dr., Newtown Square. ColonialPlantation.org. Herr Foods, Inc. USA Today’s 2016 Readers’ Choice #1 Best Factory Tour—beating Hershey’s Chocolate World, at #4! Factory tours show the real operation, with real workers and include secrets like how tortilla chips get their flavor. Tours end at the Snack Bar and Gift Shop. Reservations required. To schedule: 800-284-7488; or reserve tickets online: Herrs.com. The Village of Oxford celebrates its 250-plus-year history in a charming historic district. 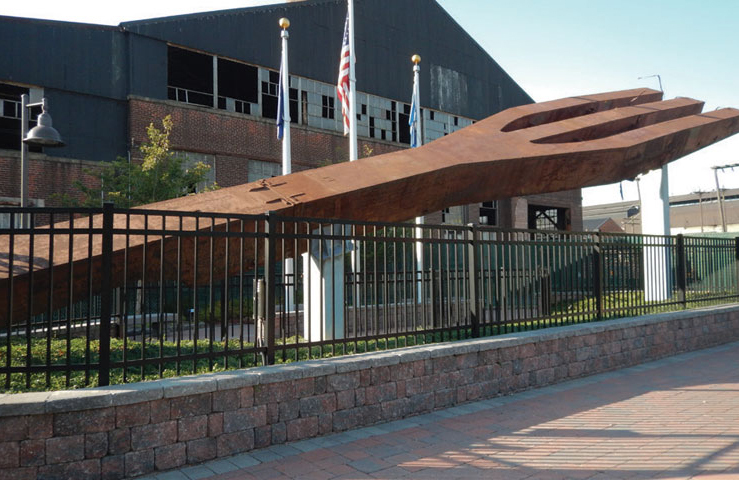 Try the Bridge Tour Walking Tour to enjoy shopping and refreshments in town or check out the Connective Art & Music Festival on Aug. 4. For tours, coupons, guides and more, visit DowntownOxfordPA.org. Goschenhoppen. One of the oldest continuously existing Pennsylvania German communities in America preserving the folk culture of this area’s earliest immigrant settlers, known as the Pennsylvania Dutch. Today, the Goschenhoppen Historians, Inc. maintain museums, a library and offer educational and seasonal events such as the 52nd Annual Pennsylvania Dutch Folk Festival, Aug. 10–11, Henry Antes Plantation, 318 Colonial Rd. Goschenhoppen.org. The Carousel at Pottstown. The second oldest operating Philadelphia Toboggan Company wooden carousel in the United States. 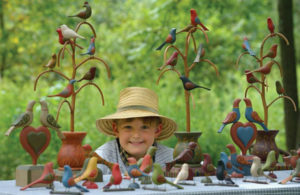 Each custom carved figure took local artists over 250 hours to sand, paint and finish. 30 West King St. CarouselAtPottstown.org. QVC. A guided tour takes you through the broadcasting facility including a view from the Observation Deck where guests may be able to watch QVC programs in progress and catch a glimpse of a favorite host or guest. 1200 Wilson Dr. QVC.com. The town of New Castle, established in 1651 and where William Penn landed in 1682, is a beautifully preserved Colonial town center on the Delaware River. Visit Immanuel Church and its churchyard (dating back to 1703), and the George Read II House, a grand Federal mansion surrounded by a handsome garden. NewCastleCity.Delaware.gov. Historic Houses of Odessa. An outstanding collection of period household furnishings, fine and decorative arts. 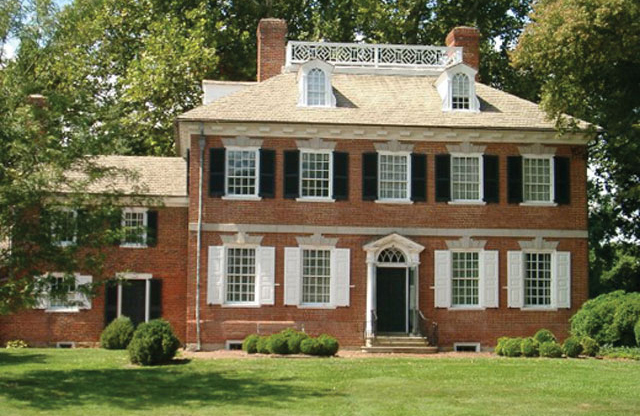 Five distinctive properties are unique examples of the architectural heritage of Colonial Delaware and tell of Odessa’s role in the Underground Railroad. Be sure to visit Sept. 8 for the Historic Odessa Brewfest with craft beer, live music, great food, vendors and more. OdessaBrewfest.com, HistoricOdessa.org. Above & Beyond Ballooning. Take a scenic ride above Chester, Berks and Montgomery counties and celebrate with a post-flight champagne toast. A memorable and unique experience for the whole family. USAHotAir.com. Downingtown Playdium. Make it through the laser maze and reward yourself with some video arcade games. Don’t forget to redeem your tickets for exciting prizes before you leave! 3949 Lincoln Hwy. W. DowningtownPlaydium.com. Downingtown Rock Gym. This Rock Gym is for people of all ages and abilities. Beginners learn the basics of rock-climbing and more experienced climbers test their skills in advanced climbing lessons or seek a new adventure on the outdoor rock climbing area. 462 Acorn Ln. DowningtownRockGym.com. Urban Air Trampoline & Adventure Park. From the obstacle course, balance beams, tubes, the runway tumble track and slam dunk zone and on and on. Great place on a rainy day or for a birthday party. 981 E. Lancaster Ave. UrbanAirTrampolinePark.com. Round 1. There’s fun for the entire family at this state-of-the-art entertainment arena. Mom and Dad can enjoy Happy Hour Specials on draft beers and wine while kids participate in activities like bowling, arcade games and karaoke. Exton Square Mall, 172 Exton Square Pkwy. Round-1USA.com. Oasis Family Fun Center. Safe, clean fun for the entire family including a Ballocity Arena, Soft Playground, Rock Climbing Wall, Laser Maze, Jumpshot Trampoline Basketball and Arcade Games plus a full service snack bar. 35 Lacrue Ave. OasisFamilyFun.com. Sky Zone Trampoline Park. Literally bounce off the walls of this indoor trampoline park. Jump into the foam zone on the trampoline dodgeball court and slam dunk with hoops for kids of all sizes. 10 Conchester Rd. SkyZone.com/GlenMills. Dutch Wonderland. Fun for kids, with over 30 rides—two coasters, Duke’s Lagoon water play area and live entertainment shows. Rt. 30, 4 mi. E of Lancaster. DutchWonderland.com. Grand Slam USA. Keep the family active with over 30,000 square feet of athletic activities and sports for all ages plus unique attractions like Ninja Obstacle Course, Nerf Blaster Battle, Spaceball Trampoline and Human Foosball. 11 Lancaster Ave. GrandSlamMalvern.com. Brandywine Outfitters. 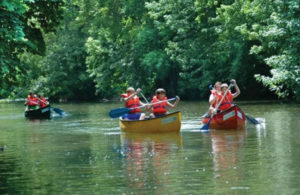 Enjoy a scenic canoe or kayak trip with the whole family down the Brandywine River. 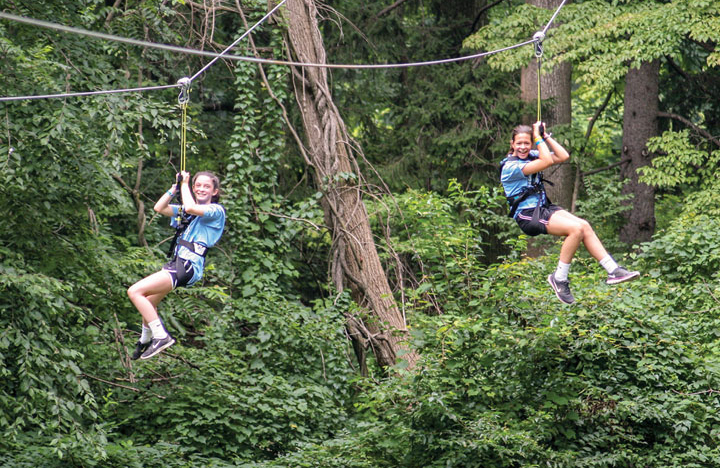 If you are looking for a whole weekend of fun, grab your sleeping bag and pitch a tent on the 26-acre private park in the heart of Chester County. 2096 Strasburg Rd. CanoePA.net. Jumpers Family Zone. Indoor playzone with Soft Playground, Safari Slide, Jungle Obstacles and Little Cub Play Area. Enjoy the fun any day of the week or host your next party—you can even create invitations on Jumper’s website. Ridley Creek Plaza, 5117 West Chester Pk. FunAtJumpers.com. Arnold’s Family Fun Center. An action-packed day riding go karts and other rides. Try both laser tag attractions, Black Light Mini Golf and bowling. Not only will the kids have fun, but parents can enjoy Arnold’s Bistro & Bar while they play. 2200 West Dr. ArnoldsFFC.com. Brandywine Picnic Park. The region’s largest picnic park allows families to enjoy the scenery of the Brandywine River while trying delicious food. Bring the kids to play in the private park and participate in fun activities like paddleboating, tubing, mini golf and rock-climbing. 690 S. Creek Rd. BPPHHC.com. Northbrook Canoe Company. Cool off along the beautiful Brandywine River with a peaceful, self-guided canoe, kayak or tubing trip. Continue your fun with your favorite summer foods. Res. encouraged; walk-ins welcomed. Open daily, May through October with the first trip at 9 am, last one at 4 pm. NorthbrookCanoe.com. Treehouse World. A place to explore the newest and coolest treehouses around, to challenge yourself with their unique high adventure programs and a place to have a ton of fun. 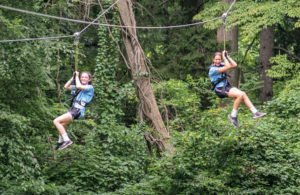 You can also take the Aerial Zipline Adventure Course with 3 ziplines and 8 bridge crossings that take you high above the headwaters of the Valley Creek. 1442 Phoenixville Pk. TreehouseWorld.com. West Chester Railroad. See July Picks. Altitude Trampoline Park. Spend a day on the tumble tracks, foam pit and dodgeball court, or participate in group fitness classes. This high-energy indoor trampoline park is perfect for a rainy day or to burn off some energy. 510 Justison St. AltitudeWilmington.com. John James Audubon Center at Mill Grove. The fieldstone mansion, now a museum, displays Audubon’s major published works and memorabilia. The 175 acres are a wildlife sanctuary with 175 species of birds and 400 species of plants. 1201 Pawlings Rd. JohnJames.Audubon.org. Morris Arboretum. The official arboretum of PA. On its 92 public acres, thousands of rare plants (many of Philadelphia’s oldest, rarest, largest trees) are set in a Victorian garden. Award-winning rose garden, English landscape park, loggia and hidden grotto, Japanese gardens and swan pond. Special events. 100 E. Northwestern Ave. MorrisArboretum.org. Great Valley Nature Center. Home to quality environmental education programs. Full-sized replica of a Lenape Village shows what life was like for Native Americans 500 years ago. Rt. 29 & Hollow Rd. GVNC.org. Jenkins Arboretum. A 46-acre arboretum that emphasizes azaleas, rhododendrons and plants of local woodlands, including groundcovers and colorful wildflowers that bloom over a long season. 631 Berwyn Baptist Rd. JenkinsArboretum.org. Tyler Arboretum. A 650-acre preserve originated with brothers Jacob and Minshall Painter. Mature plant collections are laid out in a natural setting, with 20 miles of marked trails. Education center, museum collections, library. 515 Painter Rd. TylerArboretum.org. Willistown’s Okehocking Preserve. 180 acres of the 500-acre Okehocking Land Grant Historic District are likely the only known grant to an Indian tribe authorized by William Penn, conveyed in 1703. Includes meadowlands, upland hillsides and old-growth woodlands, with 5 miles of hiking and horse riding trails. 5316 West Chester Pk., Willistown.Pa.us. Welkinweir. This historic country estate is home to Green Valleys Watershed Association, a nonprofit dedicated to preserving the natural resources of northern Chester County. Nature walks and talks, summer camps and volunteer opportunities are offered on 219 permanently protected acres of forests, meadows and an arboretum overlooking multiple ponds. 1368 Prizer Rd. Welkinweir.org. Scott Arboretum of Swarthmore College. “A garden of suggestions,” it’s the college campus, covering 110 diverse acres. 500 College Ave. Scott Arboretum.org. E. Myrick Conservation Center. A 300-acre landscape with vegetation and wildlife habitats. Part of the Brandywine Valley Assn., which has worked for over 50 years to protect the Brandywine Creek. Two marked self-guided nature trails—Hill and Stream Trail and Farm Path Trail. 1760 Unionville-Wawaset Rd. (Rt. 842). BrandywineWatershed.org. Ashland Nature Center. Headquarters of the DE Nature Society, 130 acres of meadows, forests, marshes, streams and ponds make an ideal setting for nature programs each year, geared to all ages and all levels of interest. Brackenville & Barley Mill Rds. DelawareNatureSociety.org. Mt. Cuba Center. A botanical garden that inspires an appreciation for native plants and a commitment to protect the habitats that sustain them. 3120 Barley Mill Rd. MtCubaCenter.org. Bombay Hook National Wildlife Refuge. This 16,000-acre refuge is one of the best places on the East Coast to view migrating and resident waterfowl, especially in spring and fall. Auto tours, walking paths, observation towers and boardwalk trail. 2591 Whitehall Neck Rd., Rt. 9, E of Smyrna. FWS.Gov/Refuge/Bombay_Hook. The Marian Coffin Gardens at Gibraltar. The grounds of an 1844 restored estate listed on the National Register of Historic Places. The gardens are “rooms,” each with unique character. 1405 Greenhill Ave. PreservationDE.org. Daniel Boone Homestead. Daniel Boone was born here in 1734 in a log house built between 1730–1779. Other buildings include a PA bank barn, blacksmith shop, sawmill, log house and visitors center. 400 Daniel Boone Rd. DanielBooneHomestead.org. Thomas Massey House. One of the oldest English Quaker homes in PA, built in 1696. Lawrence & Springhouse Rds. ThomasMasseyHouse.org. Harriton House. Home of Charles Thomson, Continental Congress secretary, furnished with 18th-C. antiques. Originally part of a 700-acre, 1700s plantation. 500 Harriton Rd. HarritonHouse.org. The Mill at Anselma. On the Pickering Creek, the Mill is an extraordinary artifact of 250 years of Chester County’s industrial heritage retaining its original Colonial-era power train, and multiple layers of industrial equipment. Demonstrations and hands-on activities. 1730 Conestoga Rd. AnselmaMill.org. Historic Yellow Springs. Originally named by Native Americans for the iron-rich “yellow” spring water, this scenic village became the principal hospital for the Continental Army during the Valley Forge encampment and an 18th-century mineral water spa. Site of art, crafts and antique shows. Art School & Pikeland Rds. YellowSprings.org. Joanna Furnace. Hay Creek Valley Historical Assn. supports local heritage and provides a living experience of Berks County’s agricultural and technological past by demonstrating early American crafts and trades. 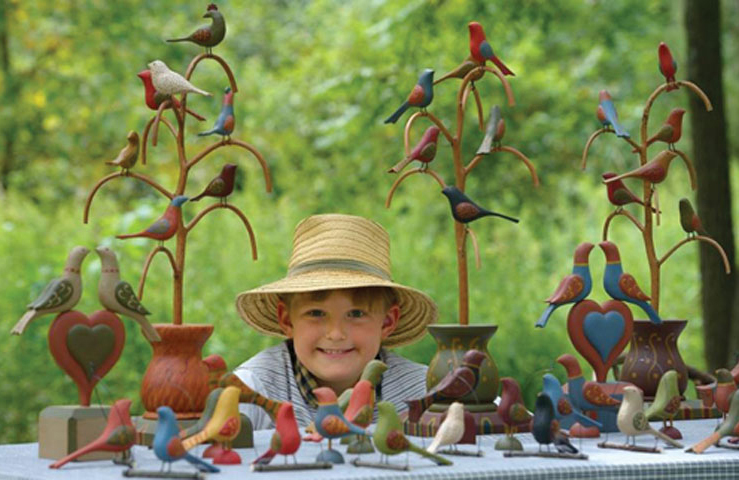 The Hay Creek Festival, Sept. 7–9, features Early American crafts, antique toys, Civil War encampment, home crafts, children’s hands-on activities, food and olde tyme music. Rt. 10. HayCreek.org. Rock Ford Plantation. The 18th-C. Georgian-style home of Revolutionary War hero General Edward Hand. In Lancaster County Park, the estate includes the mansion, barn and Kauffman Museum of decorative arts. 881 Rockford Rd. RockFordPlantation.org. Pennsbury Manor. William Penn’s beautiful country plantation on the Delaware River, rebuilt to look as it did in 1700. Jacobean-style furnishings include 17th-century antiques. 400 Pennsbury Memorial Rd. PennsburyManor.org. Paoli Battlefield and Historic Waynesborough. Visit Paoli Battlefield where British troops routed General Wayne in 1777, or Waynesborough, a magnificent Georgian-style country manor house that was home to General “Mad Anthony” Wayne, home to seven generations of the Wayne family. PBPFInc.org; HistoricWaynesborough.org. Pottsgrove Manor. Built in 1752, this is the historic home of John Potts, Colonial ironmaster and founder of Pottstown. Distinguished for its fine early Georgian architecture. Rt. 100 & W. King St. MontCoPA.org/HistoricSites. Pennypacker Mills. A Colonial revival mansion, this home of PA Governor Samuel W. Pennypacker was preserved as a country gentleman’s estate. 5 Haldeman Rd. MontCoPA.org/HistoricSites. St. David’s Episcopal Church. A stone wall encloses St. David’s graveyard, memorialized in Longfellow’s poem: “What an image of peace and rest is this little church among its graves …” This park-like setting is welcoming and serene, with an intimate stone church, a fine example of early Colonial architecture. 763 S. Valley Forge Rd. StDavidsChurch.org. Hans Herr House. Oldest house in Lancaster County and oldest Mennonite Meeting House in America, built in 1719. Explore the main floor, the attic and cellar, plus farm museum and Colonial garden. 1849 Hans Herr Dr. HansHerr.org. Peter Wentz Farmstead. Colonial farmhouse used by George Washington before and after the battle of Germantown, restored to its 1777 state. Schultz Rd., off Rt. 73. MontCoPA.org/HistoricSites. 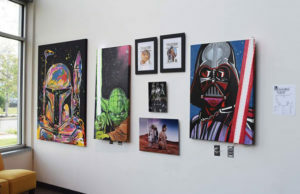 Christian Sanderson Museum. A fascinating look at one man’s life and our Nation’s history—200 years of history in 1500 square feet. Enter the museum to uncover artifacts from the Revolutionary War, Civil War, both World Wars and learn about the Battle of Brandywine along with other local lore. 1755 Creek Rd. (Old Rt. 100). SandersonMuseum.org. Lukens National Historic District Museums. Lukens National Historic District Museums. Industrial history and architectural heritage are woven together so you can “Discover the Past, Explore the Future.” Three mansions—Rebecca Lukens House (c. 1739); Terracina (1850-51) and Graystone Mansion (1889)—plus the National Iron and Steel Heritage Museum are the highlights when you visit. 50 S. First Ave. Coatesville. SteelMuseum.org. DeMuth Museum. Describing itself as “National in scope, while reflecting the distinctive character of the Lancaster region,” the Demuth Museum, located in the artist’s former home, includes workrooms and gardens where artist Charles Demuth lived. 120 E. King St. Demuth.org. The Delaware Contemporary. A non-collecting contemporary art museum and gathering place for exploring new ideas in art, design, and technology. 200 S. Madison St. DEContemporary.org. Delaware Children’s Museum. The big yellow building along the Riverfront focuses on science, math and technology and engages children in playful learning. 550 Justison St. DelawareChildrensMuseum.org. Delaware History Museum. Originally a Woolworth’s Department Store (1940), the building has been transformed into the Delaware History Museum and the Jane and Littleton Mitchell Center for African American Heritage. 504 N. Market St. DEHistory.org. Rockwood Museum. Designed in 1851 by English architect George Williams, an outstanding example of Rural Gothic architecture and gardenesque landscape design. 610 Shipley Rd. Rockwood.org. Marshall Steam Museum at Auburn Heights Preserve. Home to the world’s largest collection of operating steam cars and a 1/8-size live steam railroad on the 250-acre grounds, which are part of the DE State Park system. Visit their website to find out about their special events such as, Evenings at the Museum, Steamin’ Days and more. 3000 Creek Rd. AuburnHeights.org. Boyertown Museum of Historic Vehicles. Featuring vehicles of all types: gasoline, electric and horse-drawn, including carriages, wagons and sleighs. You’ll see “high wheelers” and “safety bicycles,” vehicle builder’s tools and local historic roadside architecture. 85 S. Walnut St. BoyertownMuseum.org. The National Watch & Clock Museum. Featuring the treasures of time, from ancient timepieces to modern technologies, the museum captures the evolution of timekeeping over the centuries. 514 Poplar St. NAWCC.com. The Kennett Underground Railroad Center at the History Station. The Center takes visitors to a time when slavery existed and the Underground Railroad was a “trackless trail.” Kennett-UndergroundRR..org. Landis Valley Museum. The Landis Valley Village & Farm Museum, a more modest version of Sturbridge Village, is devoted to the PA German rural heritage and is a nationally known living-history village dedicated to this history and culture, spanning 1740 to 1940. 2451 Kissel Hill Rd., Lancaster. LandisValleyMuseum.org. Hands-On House Children’s Museum. Offer-ing interactive activities for kids and families, through self-directed exhibits and programming that stimulate curiosity and invite the joy of discovery for everyone. 721 Landis Valley Rd. Call for dates and hours. HandsonHouse.org. The Wharton Esherick Museum. The stunning home and studio of renowned artist and sculptor Wharton Esherick (1887–1970), who inspired the Studio furniture movement. The Wharton Esherick Museum is a National Historic Landmark for Architecture, housing 50 years of work. Tours by reservation only. 1520 Horseshoe Trail. WhartonEsherickMuseum.org. Mid-Atlantic Air Museum. Story of aviation told by displays of restored classic and historic aircraft. Rt. 183 N, Reading Reg. Airport. MAAM.org. The Antique Ice Tool Museum. Follow the “ice man” from the harvest of the first major winter freeze to the storage, transportation, delivery and consumption of the product that shaped the way of life in this country from 1803-1940. 1825 Sconnelltown Rd., AntiqueIceToolMuseum.org. Got a thirst for wine? Explore the popular wineries in Chester County and delight your taste buds. Here are some worth a visit this summer. Featuring music fests and food trucks, this winery is perfect for a picnic while sampling new wines and food. Hours are extended during Longwood’s Summer fireworks shows so visitors can enjoy wine and fireworks. Sip some wine while you experience this historic site where British soldiers were housed during the Battle of the Brandywine. Want to discover unique and unconventional wines? Then head to this vineyard for a taste like nothing you’ve ever tried. Attend monthly events where you can try a variety of wines while painting a wine glass to take home. This historic stone barn near the French Creek offers a relaxing place to enjoy some wine. Enjoy the view and calming sounds of the Brandywine River while picnicking and drinking wine. Lace up your shoes and run the Vineyard 5k then enjoy a post-race afterparty with wine tastings. The only American Winery where guests can try gold medal award winning Champagne and expertly crafted traditional dry wines in the same place. Pets are welcome to relax on the lawn while guests enjoy the wines during an afternoon concert. Buy this wine by the bottle at local farmer’s markets such as Booths Corner, Westtown and Lansdowne. Wayvine wine can be found at local restaurants including SawMill Grill, Victory Brewing, The Farmhouse and Sidebar. Soak up some scenery and head out to a popular hiking trail, listed below from shortest to longest. Find your favorite or explore them all! At the first Chester County park, dedicated in 1963, visitors can relax in a pavilion or hike along an 18-station mile-long fitness trail. A 1.1-mile-long asphalt pedestrian path takes you near history, allowing access to the Brandywine Battlefield National Historic Landmark. Mostly grassland, this is the haven for wildlife and a great place for birdwatching or a 2-mile walk. Over 900 acres of trails, play areas, fishing spots and campgrounds make this a good place for a quick 2.2-mile hike on Rim Trail or a long weekend stay. A 4.6-mile hike on flat terrain full of historical views of Rapps Dam, Snyder’s Mill and Jacob Rudy’s Powder Mill and part of French Creek State Park, where visitors can camp, boat, sled and hunt. The Preserve’s 180 acres of meadows, uplands, wetlands, riparian areas and mature woods include 5.75 miles of trails and a Nature Center. Enjoy 9+ miles of trails and 1,282 acres of nature preserve, full of woodland, meadows, corn fields and stream valleys. Take a relaxing walk or bring the kids to Ollie Owl’s NaturePlayGround. Head out on the 14-mile asphalt trail for inline skating, cross country skiing and leashed dog-walking. With 535-acre Marsh Creek Lake, this park is ideal for sailing, fishing and water sports. Plus a summer camp for kids. Running 30 miles along the Schuylkill River, from Parkerford to Philadelphia, this trail is part of the 750-mile Circuit Trails and draws over 20,000 runners, bikers and commuters each year. Located on 300 acres of rolling hills in southern Chester County, the Brandywine Polo Club is one of the East Coast’s oldest polo establishments, dating back to 1950. Spectators are invited to picnic or tailgate on a Sunday afternoon or Friday night under the stars and catch a glimpse of local horse country. Called the sport of kings, polo is an enjoyable way to spend an afternoon or evening with your friends and family. Twilight Polo on Fridays features live music and dancing as well as food and drink for sale. On Sunday tailgaters come out in style. Field-side tailgating, available for the season or by the day, allows you to park at the field‘s edge and tailgate from your car. 232 Polo Rd., off Newark Rd., S. of the Rt. 1 Toughkenamon exit. Fri: gates open at 5, matches at 5:30. Sun: gates open at 1:30, matches at 3. $15. Matches cancelled for wet fields or extreme heat; 610-268-8692 to confirm. BrandywinePolo.com.